Pour corn flakes into a quart size resealable bag and crush with a rolling pin or mallet. Add ranch seasoning mix. Dip drumsticks into flour, the egg and place in bag (two at a time.) Seal bag and shake to coat chicken. Repeat with remaining drumsticks. Bake drumsticks on rack in shallow pan at 375 degrees for 50 minutes or until juices run clear when pricked with fork. 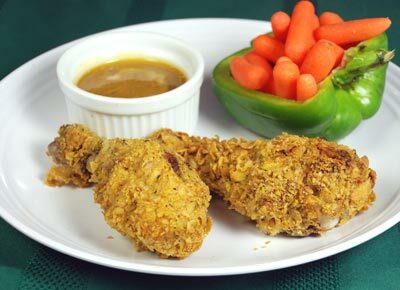 Serve with honey mustard sauce for dipping. Save $3.00 on ONE (1) Purina® Beyond® Dry Dog Food bag, any variety (3 lb or larger). Available on all varieties of Tippy Toes Infant Formula.